The big stores sell steel doors at very low prices, but how? Because the doors they sell are made of steel, but the frames they come with are made from soft wood. Masonite Steel Entry Doors come in their own steel frames. We install them with hidden fixings so that break-ins are 10 times more difficult. Are they expensive? No, if you have prevented someone from stealing your, snow blower, lawn mower or even your car. 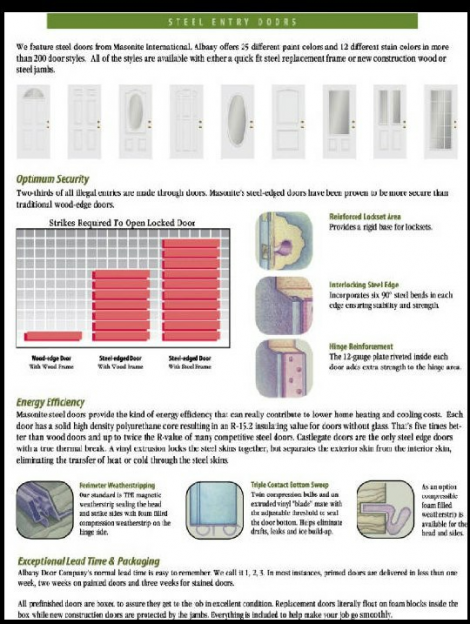 We use Schlage locksets for higher security and longer life and offer a wide variety of styles and colors. Backed by our 1 year installation warranty these doors will add security to your home or garage.